Since the November 2016 election my email inbox and my social media feeds have been filled with claims that President Donald Trump has been anointed by God. They cite prophecies, both ancient ones found in the Bible and modern-day pronouncements by contemporary Christian leaders. They claim he has been put in place to do this or called to do that. Is Donald Trump anointed by God? What does that mean? What does that NOT mean? First, let’s look at a few Bible words. Jacob was the first person in the bible to pour oil on a memorial stone pillar at Bethel, although the Hebrew word mashach is not used. Later, Moses was instructed to mashach (anoint) items in the tabernacle. These were inanimate objects, set apart as holy by rubbing olive oil on them. Priests were anointed by Moses for service in the Tabernacle. In many English translations, the King of Tyre is symbolically called “the anointed cherub” (using a similar related word, not mashach). Some have believed this “anointed” one to be referring to Satan, though I do not hold this view. Again, this is a different but related word. The Greek equivalent of mashiach is Χριστός christos, used in the New Testament of Yeshua the Messiah (Jesus Christ, Christ Jesus) and also in the compound word antichristos – the opposite of, instead of, or (according to Thayer’s) the adversary of the Messiah. The Greek word χρίσμα, chrisma (not to be confused with charisma), meaning “anointing” only appears in 1 John 2:18-27 regarding how to recognize antichristos, or anyone who denies that Yeshua is ho christos, or hamashiach, The Messiah. Popular phrases such as moving, walking or flowing “in the anointing” are foreign to the Bible. In the Hebrew Scriptures, mashiach is used in Vayikra (Leviticus) to describe the anointed priest (hakohen hamashiach). In several other places, it is used of King Saul and of King David. King Solomon, though anointed by men, is never called “the Lord’s anointed.” In Lamentations 4:20 the word likely refers to King Zedekiah, and in Habakkuk 3:13 it may refer to the people of Israel or it may be a reference to the promised Messiah (Yeshua). Daniel 9:25-26 prophesies of Yeshua the Messiah. Isaiah 45:1 says, “Thus says Yahweh to his anointed, to Cyrus…” More on that a little later. It is important to note that all of those called mashiach are leaders in Israel, with the exception of Cyrus. The Persian king was “anointed” in order to act on behalf of Israel, restoring Israel to the land after the Babylonian captivity. Though anointing is considered to be a common middle-eastern practice of the time, the Bible does not mention anointing outside the context of Israel. The LORD said to him [Elijah] “Go, return on your way to the wilderness of Damascus, and when you have arrived, you shall anoint Hazael king over Aram; and Jehu the son of Nimshi you shall anoint king over Israel; and Elisha the son of Shaphat of Abel-meholah you shall anoint as prophet in your place (1Kings 19:15-16). What was the prophecy in this anointing? This instruction is followed by an interesting summary. You can see in the stories of these three people that they carried this out. “It shall come about, the one who escapes from the sword of Hazael, Jehu shall put to death, and the one who escapes from the sword of Jehu, Elisha shall put to death (1 Kings 19:17). These are three very different anointed people, with very different purposes to carry out for God. All of them were anointed, but none of them were ever called mashiach. Let’s take a look at each one and see if there is any comparison to an “anointing” on Donald Trump. His story is given in the first 13 chapters of 2 Kings. Elisha was a prophet to the Northern Kingdom of Israel, given a “double portion” of the spirit of Elijah. Some say that his story includes exactly twice the number of miracles performed by his mentor. Elisha was recognized as a “holy man of God” (2 Kings 4:9). One would be hard pressed to draw any commonality between the prophet Elisha and President Trump. His story is found in 2 Kings 9 & 10. A military captain in Israel, Jehu assassinated King Ahaziah of Judah and a large group of Ahaziah’s relatives, King Joram of Israel, and the wicked Queen Jezebel. He then assumed the throne in Israel. King Jehu claimed to have a zeal for God, and arranged an ambush where all the worshippers of the false god Baal were killed. Jehu “eradicated Baal out of Israel” (2 Kings 10:28), but Scripture tells us he “was not careful to walk in the law of the LORD, the God of Israel, with all his heart” (2 Kings 10:31). For more on this, read my post on Jehu’s Revival. Jehu was cleaning house, bringing Israel (the Northern Kingdom) back to where it was spiritually when it was first established after the split from Judah. In that aspect, one might see a comparison to Donald Trump’s effort at “draining the swamp.” Jehu also appears to have a pretty big ego. Although commended for his housecleaning in Israel, his legacy did not stand and his lineage was ultimately judged for their actions against Judah (Hosea 1:4). There is some similarity, but to associate the anointing of Jehu to an anointing of Trump seems a stretch. Hazael was an attendant to the king of Aram (Syria); he was not an Israelite. His story is in 2 Kings chapters 8 to 13. As prophesied by Elisha, successor to Elijah, Hazael murdered the king and ascended to the throne himself. His anointing by God to be king came through the hands of Elijah and Elisha. Hazael was an adversary to Israel and to Judah, used by God to inflict punishment for their sinful deeds. So the anger of the LORD was kindled against Israel, and He gave them continually into the hand of Hazael king of Aram, and into the hand of Ben-hadad the son of Hazael (2 Kings 13:3). I don’t think anyone would consider events associated with the alleged anointing of Donald Trump to be anything like what happened after the anointing of Hazael. I find it interesting, however, that no one seems to want to call any modern-day political figure “anointed” when they carry out actions that might be considered punishment because of the unfaithfulness of God’s people. Jerusalem fell to King Nebuchadnezzar of Babylon in 586 B.C. Cyrus the Great was the Persian king who conquered Babylon in 539 B.C. He gave the edict for the return of some Jewish captives to rebuild the Temple. Here is the passage from Isaiah, in context, describing Cyrus as Yahweh’s anointed. It is long but important. Way before the 2016 presidential election some Christian leaders, including Messianic Jewish teacher Dr. Michael Brown1, were comparing candidate Donald Trump to Cyrus the Great. This may be one of the things that mobilized the Evangelical block to vote for him. 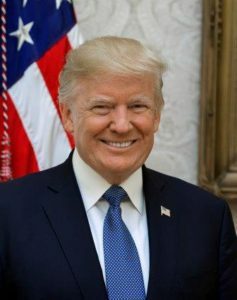 Whether or not the comparison is or was valid, by the time the election was over many more Evangelical leaders were calling Trump “anointed.” Most of the time, they reference critical issues facing the United States – things like appointments to the United States Supreme Court, laws and policies concerning the homosexual agenda, abortion laws and border security. However, it should be noted that this passage concerning Cyrus, who did not know Yahweh, as the LORD’s anointed is specifically about Cyrus’ dealings with the people of Israel. Certainly the comparison with Cyrus seems possible when considering how President Trump has dealt with modern day Israel during his administration. Chief among those is his strong relationship with Prime Minister Netanyahu, the moving of the U.S. Embassy to Jerusalem and the recent acknowledgment that Israel has sovereignty over the Golan Heights. Even with these examples, it would still seem highly questionable that modern-day “prophets” who are not obedient to the commands of God and who seem to focus more on the status of their ministries would have the authority to declare someone as mashiach, God’s anointed. Think about the prophets of 1 Kings 22. Everyone must submit to governing authorities. For all authority comes from God, and those in positions of authority have been placed there by God (Romans 13:1 NLT). Let every person be subordinate to the higher authorities, for there is no authority except from God, and those that exist have been established by God (Romans 13:1 NAB). Let every person be subject to the governing authorities. For there is no authority except from God, and those that exist have been instituted by God (Romans 13:1 ESV). The translation of Romans 13:1 varies and the context could be either civil government or ecclesiastic government. It could mean that the position is established by God or that the person in that position is appointed by God. Romans 13:1 is often cited as meaning that those leading our nation are chosen by God. While I believe God is sovereign, I also believe he both allows us to make decisions in our public elections and that he answers prayer on behalf of his people interceding for their country. I think that resulted in the outcome of the 2016 presidential election, and I also believe it resulted in the outcome of both the 2012 and 2008 elections. Because of the increased rebellion and the embracing of blatant sin in America, God permitted the election of the reprobate Barak Hussein Obama, punishing us almost to the point of no return. Think of the foreign King Hazael mentioned earlier. We could have continued down that path of destruction, but God has granted some relief in the election of Donald Trump, a man sympathetic to Biblical values and the nation of Israel, even though he is (probably) an immoral, dishonest narcissist. But to say either Obama or Trump are “anointed” is an overreach. You may disagree with my opinions regarding President Trump. That is OK. I pray, and I hope you do as well, that in leading this country he will hear the voice of The Almighty and walk in righteousness. I pray that we all do that. Ultimately, Bible prophecy is not about the United States of America. Keep your physical eyes on Israel, and your spiritual eyes focused on the King of Israel, Yeshua THE Messiah.